At AF acoustics, we offer sound testing services to our clients and are an acoustic consultant in London. We deal with a whole range of clients, from first-time developers to large building companies. We offer sound testing services at the building inspectors discretion. Any failure on sound tests will require the test to be conducted at a later date after improvements are made. We offer advice and guidance for any buildings that have failed and in the design stage . Furthermore, we provide a sound testing service that is honest, transparent as well as professional. We take a high quality and high efficiency approach to sound testing for our clients. Our sound tests are ideal for domestic soundproofing, as well as industrial soundproofing. In addition to this, our sound insulation tests always conform to the latest guidelines. If a building has been converted to flats a sound test would be required to comply with part E. Part E / Document E states that floors and party walls must be sound tested to be compliant with met standards. Document E / Part E was implemented on the 1st July 2003 and was later amended in 2004 and many times since. This important document aims to tackle noise within new builds and also refurbishments. Noise nuisance can have a big impact on the quality of life for residents. Prior to the introduction of Document E, the level of noise complaints within apartments were on the rise. The introduction of Document E enables a deeper way to combat and counter noise nuisance. How Is Sound Testing Conducted? 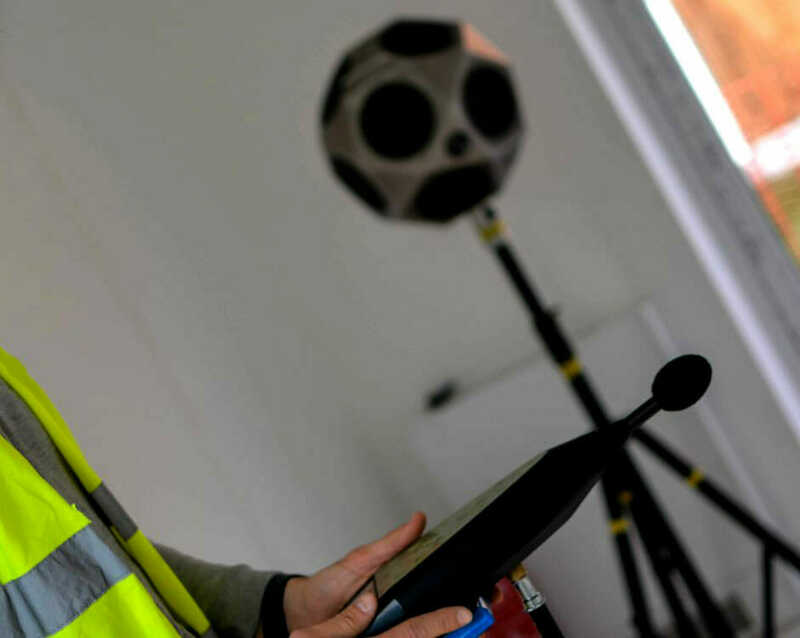 At AF acoustics, we conduct sound insulation testing for various build types. This includes commercial, residential and also industrial projects. Airborne floor sound insulation tests involve using a large speaker. The speaker itself projects white or pink noise, which is later measured. Measurements are taken from the source room and also a receiver room. Airborne noise testing also takes into consideration background noise. This means therefore, the higher the background noise, the higher the source noise will need to be. Impact sound testing requires the use of a tapping machine, which is placed on an upper apartment or flat. The noise level is recorded in the part of the flat under the room where the tapping machine is placed. BS4142 testing is conducted to measure the adverse impact sound coming from commercial and industrial sources. BS4142 is the British standard set to describe the methods used for assessing and measuring noise pollution. It was introduced to tackle noise pollution that may have adverse effects on health. The health risks of noise pollution include creating barriers that prevent children from learning as well disturbed sleep patterns. BS4142 assessments are often requested by local planning authorities. A BS4142 may be required when installing equipment such as vents, pumps or air conditioning. At AF acoustics, we conduct tests that are fully compliant to BS4142 standards. For any sound testing enquiries, please get in touch with us.